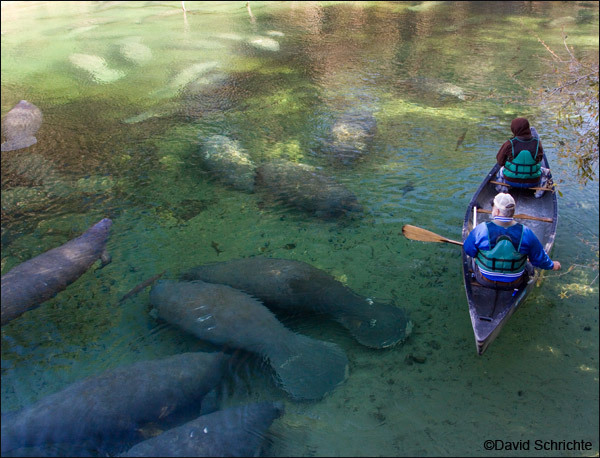 In January, the canoe used by Save the Manatee Club for manatee research was stolen from Blue Spring State Park. Cora Berchem, Save the Manatee Club’s Manatee Research and Multimedia Specialist, discovered the theft when she arrived to do the manatee count early Sunday morning, January 21st. The canoe is typically chained to the side of a walkway railing at the park with a thick, sturdy post. But the thieves were motivated: They ripped off part of the railing and took the canoe along with it. Wayne Hartley and the research canoe that was stolen from Blue Spring State Park in January. It’s unclear why the thieves wanted the manatee research canoe, which was old and had decals all over it. But it was valued by Manatee Specialist Wayne Hartley, who had been using it for over 10 years to conduct his “manatee roll calls” in the winter at Blue Spring. Wayne’s research has resulted in a very extensive body of knowledge on the manatee’s life history as well as how they use warm-water habitat. It is one of the longest running databases in existence on manatees. 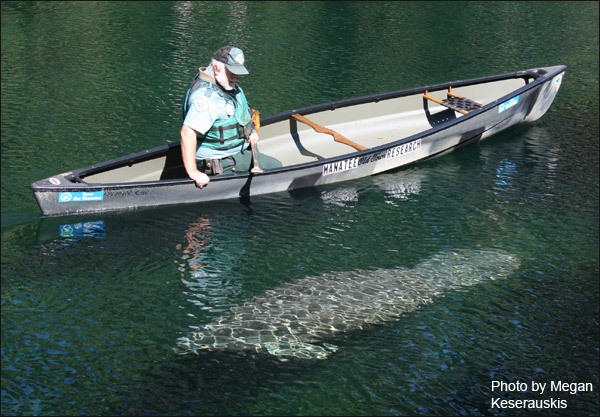 In addition, the canoe is used to monitor sick and injured manatees and share that information with manatee conservation partners. “The canoe is really an important part of our work,” said Cora. Once news of the theft got out, there was an outpouring of indignation and support. Special thanks go to Nicole Bartlett and Monica Ross, biologists with Sea to Shore Alliance, and to the staff at Outward Bound, for their swift help in securing an interim canoe for Wayne to use. And when Save the Manatee Club decided to seek funds to purchase a new canoe with the same stability as the stolen canoe, the result was heartwarming. We put up a special donation page and posted a notice on our social media pages. Television stations WKMG News 6 and WESH News 2 in Orlando both featured the news story with a link to the donation page. Overnight, generous manatee supporters donated enough funding to purchase a new canoe, and Johnson Outdoors, the makers of the Old Town canoe, gave the Club a generous discount. Wayne Hartley conducts manatee research on a cool winter morning at Blue Spring State Park. Above, Manatee Specialist Wayne Hartley and Cora Berchem, the Club’s Manatee Research and Multimedia Specialist, use the Club’s new canoe to conduct manatee research. Watch the video to see more. The canoe was purchased through the generosity of manatee supporters. Thank you for your help!